Brian has, for some time now, been preoccupied with the idea of ramen with, among other things, corn. I have a long and complicated history with ramen, having eaten the crappy seasoning packet version just about every night during my first three years in college. And gained twenty pounds in the process! So, I don’t advocate the seasoning packet. Or eating ramen as a snack every evening during unrestrained munchie attacks. 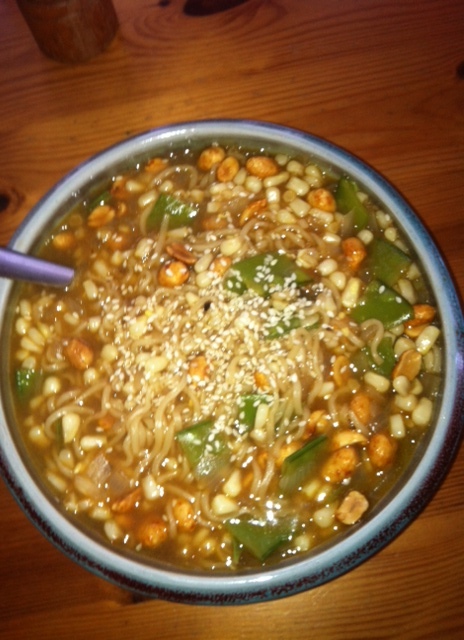 But ramen made properly with good ingredients can be fast, easy, flexible, warming and nourishing as a meal. Or when you’re not feeling well. So, I made Brian the deluxe corn version the other day and then he copied it and added a few extras. He was in ramen heaven. My version started with sauteeing some sliced shallots in a bit of canola oil in a medium soup pot. Brian used onion. You could substitute or add garlic or scallions. Then I added a couple of cups of stock. The best stock on the market is Swanson’s Organic Chicken Stock. It comes in a quart size box. Pacific makes little boxes; the flavor is not as good and you’d need more than one box for a batch of ramen, but you don’t have to worry about waste. Heat to boiling while prepping other stuff. I used some sliced snap peas. You could use grated carrot, frozen peas, canned, fresh, or frozen corn*, sliced mushrooms, baby spinach. Throw in veggies and the cake of ramen, being careful not to let the offensive packet fall into the pot. Now, add whatever tasty additions: soy sauce, vinegar, sri racha or other hot sauce, sesame oil, sesame seeds, miso or wasabi are all great options. *My little nasty secret: green giant shoepeg canned corn. I discovered it years ago when i went to a very fancy summer garden party given by the owner of a long-defunct warwick bookstore. This woman was incredibly pretentious and she served the most delicious summer corn salsa. I begged her for the recipe. She sheepishly admitted it was made with canned shoepeg corn! They are tiny little white kernels, sweet as sugar, and I use them secretly all year long. Sometimes I eat them with a spoon right out of the can. Don’t tell anyone!